244 pages | 12 B/W Illus. Through case studies from around the world, this book illustrates the opportunities and challenges facing families negotiating the issues of language maintenance and language learning in the home. Every family living in a bi/multilingual environment faces the question of what language(s) to speak with their children and must make a decision, consciously or otherwise, about these issues. Exploring links between language policy in the home and wider society in a range of diverse settings, the contributors utilize various research tools, including interviews, questionnaires, observations, and archival document analysis, to explore linguistic ideologies and practices of family members in the home, illuminating how these are shaped by macro-level societal processes. "An important contribution to the new studies that help understand why the family is such an important site for the study of language policy. This interesting collection of cases makes clear the complex external influences and internal beliefs (some probably mistaken) that influence language choice in the family and neighborhood." "Family language transmission is closely intertwined with social and political macro developments. By shaping language transmission, families themselves act as political players, (un)consciously opposing or following power relations. 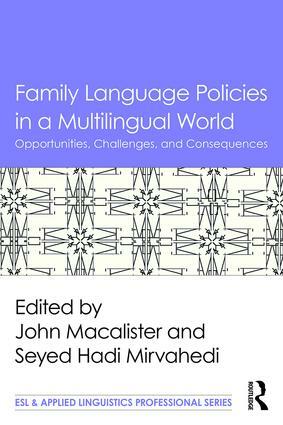 This volume on family language choice thus provides invaluable perspectives on potential balance and power shifts within the near future and in different contexts around the world." John Macalister is Associate Professor in the School of Linguistics and Applied Language Studies at Victoria University of Wellington, New Zealand. Seyed Hadi Mirvahedi is Lecturer at Azarbaijan Shahid Madani University, Iran. This series provides essential texts on teaching English as a second language and applied linguistics. It includes authored and edited volumes to be used as primary or supplementary texts in graduate-level and teacher training courses to enhance students’ and practicing teachers’ professional qualifications and knowledge. Each text is designed to promote the current and growing body of knowledge in applied linguistics and second language teaching, including advances in teacher education and the study of language. Specifically, the series includes, but is not limited to, current uses of applied linguistics research in teaching a variety of second language skills, such as reading, writing, speaking and listening; materials and curriculum design; literacy; English for academic purposes; and research methods. The texts also deal with broad domains of professional preparation related to socio-cultural perspectives and current issues/topics in teaching and learning a second language. Books in the series benefit not only students, but experienced teachers, curriculum developers, teacher trainers, program administrators, and other second and foreign language professionals seeking to advance and update their knowledge and expertise.